For many people, a spiritual path is like a well from which to drink - to feed the soul, nourish the mind, body and spirit. The prayers and practices of a system that may have been handed down since ancient times, or perhaps a newer expression of the search for peace and wholeness, can be like 'the living waters' that so many traditions speak of. 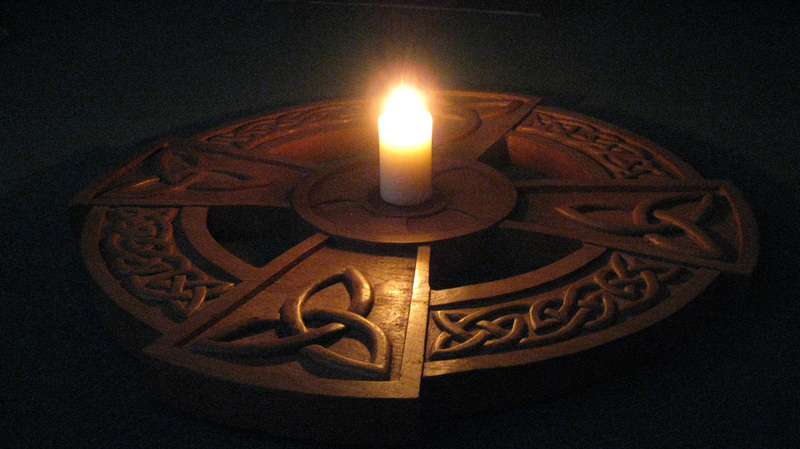 Among the many rich seams of spiritual traditions of the world, there is an ancient path which is the oldest continuous spiritual lineage in the Celtic countries. It is a living tradition, based in Scotland, which dates back more than a thousand years to a time which saw the seamless weaving together of an ancient spirituality of the land with a new awareness of a God of Love. This is the Order of Céile Dé - the servants or spouses of God. Their daily and spiritual life is largely contemplative and nurtures a deep and devotional relationship with that Great Mystery we call God - the Invisible Beloved Whose Face is Everywhere... The sacred chants and prayers of the Tradition reflect the longing to know Divinity through being a physical presence within the green world of God’s hand. The teachings and daily contemplative practice of this tradition encourages integration of spiritual practice with everyday life, through practices which support the process of spiritual transformation. Dawn light over Iona Sound. The prayers and blessings in the collection known as the Carmina Gadelica were recorded by Alexander Carmichael in the Gaelic speaking areas of Scotland, between 1855 and 1910. They represent a beautiful and unselfconscious weaving together of an ancient spirituality with early Christian beliefs. And on the household all. The prayers and blessings in this collection bring a glimpse of an age and a way of life where no part of human life and existence was seen as too menial or trivial to be blessed with the Light of God, and experienced through the veil of that Light. A time when the smallest act of human life was seen as holding the potential to experience heaven here on earth – through seeing each action of a human life as a sacred act, which holds the key to the relationship with God. The Isle of Iona, which lies off the West coast off Scotland, has a special place in the hearts of those who follow a Celtic spiritual tradition. Traces of early settlements here seem to suggest the presence of early Céile Dé hermits, living on its shores and in secret places of the island. Some believe that The Book of Kells had its origins here. On the Isle of Iona it is easy to feel the power of the spirituality we find in the Carmina Gadelica, which stems from the ancient lineage of saints and a spirituality of the land. As I have sat by a bright fire on the island or wandered her white shores, I have felt that deep resonance passing down through the ages, of what it means to live a life fully in the presence of God. To belong to an age when performing even the humblest of actions such as scrubbing the step, or the more essential act of creating the life-giving warmth and light of the fire, was done to the accompaniment of prayer, sacred chant and blessing. "An ainm an Ti as airde"
"In the Name of the Highest Being, the Highest Intent"